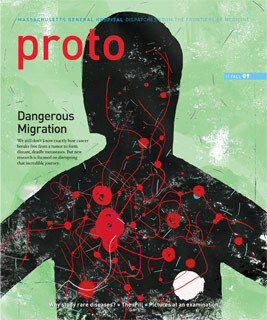 Proto cover artists Jon Han and Stuart Bradford discuss the process of translating words into images. 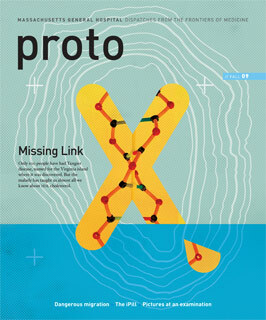 Make a difficult concept accessible and compelling—that was the challenge presented to Jon Han, illustrator of our Fall 2009 cover story on metastasis, which was sent to half of Proto readers, and Stuart Bradford, creator of the cover on Tangier disease, which reached the other half. Here, each describes his creative process. Jon Han starts each freelance assignment by making multiple sketches, preliminary paintings and digital drafts. “I’m learning about subjects I would never be exposed to otherwise,” says Han, whose drawings, paintings and digital collages have appeared in a variety of print publications, including the New Yorker and New Scientist, as well as in numerous gallery exhibitions in California, since he graduated from Pasadena’s Art Center College of Design in 2007. For the cover, Han devised a simple human silhouette with circular shapes representing tumors set against a neutral green background in contrast to the more complex colors and images on the story’s pages inside the magazine. Those images evoke the theme of sinister spread, he explains, with connected geometric shapes and rich tones of charcoal and crimson. “The way cancer spreads is creepy,” he says. “I wanted to show the aggressiveness and violence of cancer.” Han used a combination of blotting linoleum print ink and acrylic gouache on paper, then merged the images digitally, adding lines and accents as well. Just as Tangier disease was a puzzle for the physician who discovered it in 1959, Stuart Bradford wanted to suggest a sort of brain teaser for the cover and the progression of images that accompanied the article. His work—a combination of his own photography, found materials and digital collage—has appeared in the Wall Street Journal and regularly features in the New York Times’ Health and Science sections. Inside the magazine, the illustrations become more complex, using symbols as a unifying thread. “I enjoyed creating a rebus,” Bradford says. “The opening art is more straightforward and has a clear narrative, but the illustrations get more abstract as you go.” The main themes he highlighted are those of isolation, the feeling of a secret being revealed and the medical benefits gleaned from that discovery. From those ideas emerged the metaphor of buried treasure. Bradford also alluded to the disease’s historical and modern significance by incorporating archival photographs with graphic, delineated shapes in bright, flat colors. He used letters to represent molecules, paired with vintage-looking illustrations and vague shapes that suggest organs.